Shows & Workshops - Mime Time - Denver - for kids of all ages! Mime Time is experienced in developing workshops to suit your needs, audience and space. They can be individually tailored to age groups from preschool through senior citizens, including special needs participants. The Clown Mask stage show is a big favorite with kids. 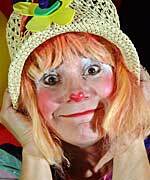 In this 45-60 minute educational show, join Miss Abbie the Clown on a trip to Clown Alley. 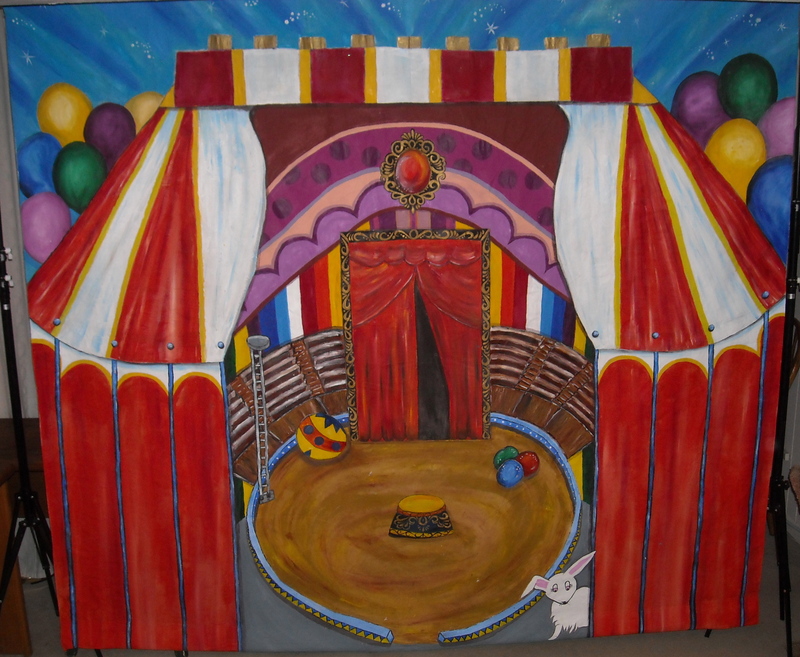 Presented in 4 acts, kids will be mesmerized as she turns from an ordinary person into a clown in a funny, entertaining style. Once transformed, Miss Abbie will keep kids laughing and amazed with magic and clowning gags. This fun and unique program ends with painted red noses for those who want one. 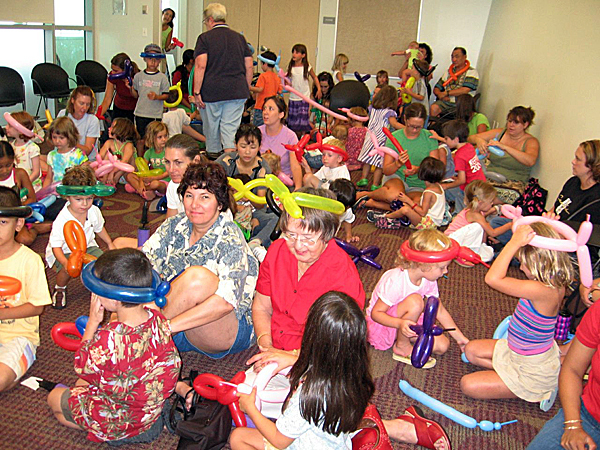 A great program for all, and a transforming experience for a child who may be afraid of clowns. A must see show! The Big Birthday Party Show is designed to fit most living rooms, the show is a series of vignettes reminiscent of vaudeville. It includes magic, music, props, audience participation, and problem solving that engages kids' attention and stimulates their imagination! Clowning Skills. This multi-session class teaches various skills including juggling, balloons, make-up, gags, and walk-around routines. 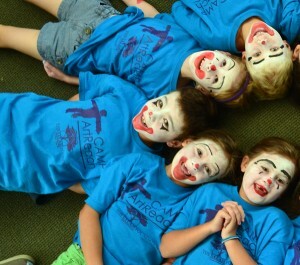 Participants will discover that clowning involves a lot more than just putting on a costume and make-up! Balloon Art. A fun and fabulous, hands-on experience where all participants learn to make several sculptures. Juggling. A hands-on experience where all participants learn how to juggle three scarves or balls, and ends with a simple trick all can do, leading to a feeling of success. Workshops in more advanced techniques, such a juggling clubs or passing, are available. Mime Technique. A participatory class where students learn the "language" of mime: the moves, the illusions, and how to tell the story. 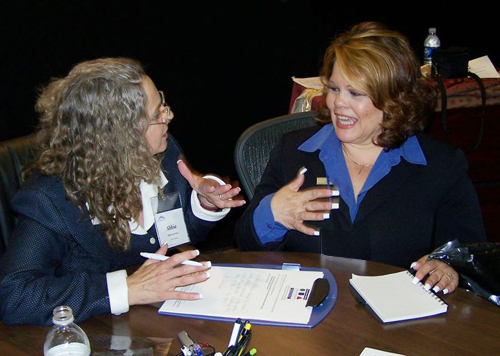 Handwriting Analysis for Teens & Adults. A rare opportunity to learn how to spot character traits like talents, desires, ambitions, honesty and integrity in your own handwriting and that of others. It's fascinating and so much fun! Henna Body Art – a hands-on introductory class in an ancient art form.